Years after Nantucket’s whaling industry virtually decimated the Atlantic whale population and became fabulously wealthy in the process, Ahab and the White Whale are gone, but the wealth and charm of the island remain. This small island (9 x 12 miles) well off the coast of Cape Cod, Massachusetts, has lost none of its magic. Late fall Nantucket is a perfect time to visit this storied island, far from summer”s “madding crowds,” and very much how she really is without the excess of tourists. . 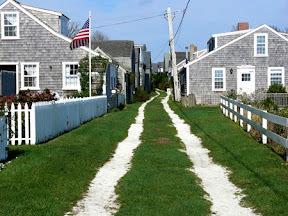 In pocket-size hamlets like Sconset, quiet, empty Lilliputian lanes criss-cross past classic squeezed-together Nantucket-shingled homes, with still vibrant flower boxes. It’s much like a a tidy English village or very much like Scotland without the hills and the shaggy sheep, though you can almost imagine them wandering aimlessly along the pristine, grass-covered lanes and nearly hear the tinkle of their bells. The town of Nantucket is staid, classy. The main streets are still unevenly cobbled with original, worn stones, and the brick sidewalks are dotted with the quiet facades of quality shops. There are lots of windows bright with nautical-themed art or quietly expensive jewelry and clothes. These are subtle, discerning shops as befits the old “Yankee ways” of Nantucket… and reflective of the tastes of the rich and famous, who come here to escape their rich and famous lives. Nantucket, for all its charms and magic, is an authentic place because the people care about the quality of their lives and culture. And perhaps because of the sea. All roads lead to the sea. It’s a great leveler, claiming many lives through shipwrecks, but providing a livelihood for today’s fishermen, and solitude along the broad empty beaches in the late fall. * There are two ferries from the mainland (Hyannis) to Nantucket, a fast and a slow one. We suggest flying Cape Air if you’re coming from New England or around Westchester County, New York. Cape Air is a “can do” airline, flexible, friendly and with a history of community caring. * There are many inns and unobtrusive B and B’s on the island, and they blend quietly into the architecture. 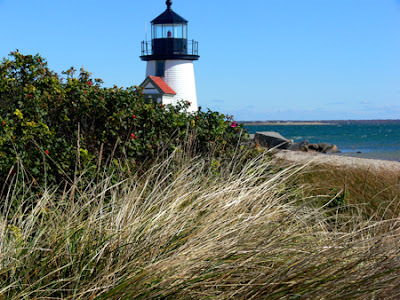 Nantucket has only 6 approved colors of paint for businesses and homes. We stayed at the Union Street Inn in the village. We would say more simply that innkeepers and owners, Ken and Deborah Withrow, have created a very special 12-room inn. The breakfasts are to order, the ever-present chocolate chip cookies and coffee are simple signs of the inn’s welcoming spirit. Careful, original touches make Union Inn a special place to stay and appreciate. The location is perfect..
We were lucky to dine at American Seasons . The food is quite extraordinary (try the Black Mission fig tempura and the Organic Salmon , Maple Parsnip puree and shaved Brussel sprouts with Bourbon Vinaigrette). Cell phones are forbidden in the dining room, and the layout is intriguing. It has a cabaret feel with narrow passageways and dim lighting. The service and wine list are impeccable. So, by the way, are the deserts. Go now while the tourists are gone.